To remove DRM from Audible audiobooks and convert the AA, AAX files to MP3, this guide will show you how. 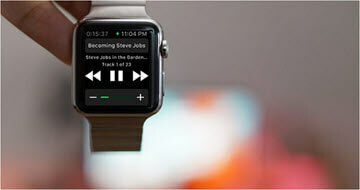 Can't listen to Audible audiobooks on Apple Watch? This is the final fix to help you play Audible on Apple Watch without a nearby iPhone. Do you want to listen to audiobooks while doing sports outside? If so, the best way is to play audiobook on an MP3 player. For your convenience, I will show you how to copy Audible audiobooks to SanDisk Clip Sport. Want to play iTunes audiobooks outside of Apple's ecosystem? Don't worry, you just need to follow this tutorial to get rid of DRM protection from iTunes audiobooks. Audible app is not on Chromecast Audio. But don't worry, you can still try these top 2 ways to cast Audible audiobooks to Chromecast from Android, iOS devices and computers. Want to burn iTunes audiobooks to CD for listening on your portable CD player or car stereo? If so, you can try this best way to save your time as well as avoid any errors. Google audiobooks are DRM free and you don't need a subscription to buy audiobooks. It is highly recommended for new users. Harry Potter novels are very popular among kids and adults. If you'd like to get Harry Potter audiobooks, you can refer to this tutorial to find the best way. The song of Achilles tells a profound love story of Achilles and Patroclus. It is a great supplement to the Homeric epics. If you enjoy Greece Myth, you will love this great audiobook. Here is the full review of it. Do you have any Audible audiobooks you are not 100% satisfied after purchasing? No problem. You can easily return the Audible audiobooks either from desktop computers or mobile phones. Do you want to save your time to convert Audible audiobooks? If so, you can try to use this batch audible convert. You can import multiple files to convert quickly with up to 100X speed. Not any audio players are created the same. To enhance your audiobook listening experience on computers, you can try these top 6 best audiobook players. Nowadays there are too many audiobooks available anywhere. If you find it hard to make up the decision which audiobook to buy, you can check these top 10 best iTunes audiobooks. Audible is the largest audiobook producer and reseller. If you enjoy listening to audiobooks, you may find that it costs more than eBooks. To help you save your money, you can refer to these top 10 Audible insider tips. Amazon Prime comes with a lot of benefits besides the two-day fast delivery service. Here I will show you the best ways on how to listen to free audiobooks with Amazon Prime. OverDrive one of the best sources to listen to audiobooks for free. You can use it on Android, iOS, Windows and Mac. If you are a beginning user, you can check this page to find out all the best tips here. Garmin GPS can not only guide you with the direction but also enable you to enjoy media files. If you'd like to move audiobooks to Garmin GPS, here are the top 2 ways for your reference. Fitbit is a great tool to help you enjoy media files when doing exercise. If you'd like to listen to Audible books when running, you can follow this tips to transfer audiobooks to Fitbit. As Audible is not supporting Google Home yet, it's a little troublesome to cast Audible audiobooks to play on Google Home. To save your efforts, we are providing the top 3 methods for you to easily stream Audible books to Google Home for listening. 2018 Christmas is coming. To learn the spirit of Christmas better, you should not miss these top 10 best Christmas audiobooks. If your MP3 audiobooks are not detected well by your players, that is mostly because of the format. 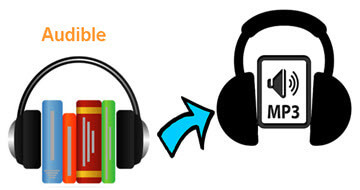 You can follow this guide to convert MP3 to audiobook formats M4A, M4B, AA, AAX. If your Nook doesn't support to install the Audible app, you can also follow this guide to transfer all your Audible AA/AAX files to Nook tablet by removing DRM protection.